Researchers asked students “how do you define success as a college student?” Their answers suggest students seek accomplishment both inside and outside the classroom. Source: Accardo, A. L. (2017). 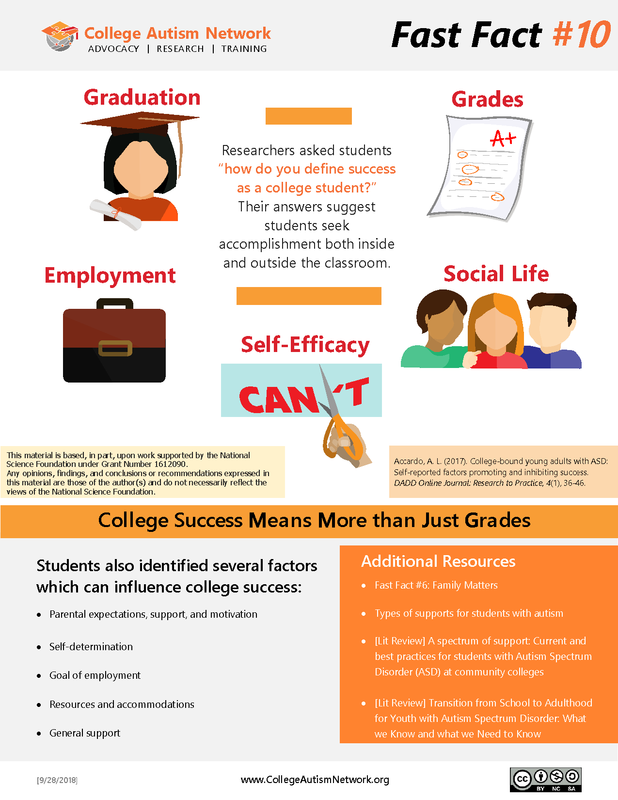 College-bound young adults with ASD: Self-reported factors promoting and inhibiting success. DADD Online Journal: Research to Practice, 4(1), 36-46. This material is based, in part, upon work supported by the National Science Foundation under Grant Number 1612090. Any opinions, findings, and conclusions or recommendations expressed in this material are those of the author(s) and do not necessarily reflect the views of the National Science Foundation.